@jim e True, but as you say “oddball racquets like..,” which implies an outlier. You did say "such as..." so I just had to throw that in. I do agree with your comments!! Why would you want to do that on a tennis racquet? I guess odd ball racquets like the T 2000 (although years ago they were not so odd ball as I strung a good # of those back in the day) , is an ATW pattern, as you do go ATW a few times with that pattern, or maybe it is considered a box pattern, or is a box an ATW, terminology?? So for the T 2000 it was not for top down. see here,,, in this video, it looks like the racquet is not centered; I count 8 on left, and10 on right from bottom!, ???? When I use to string them back in the day, I used an old Serrano machine a 2 point automatic peddle drop weight. It was the typical machine in the day back then.Still have that old beast of a machine although I seldom use it, only for an occasional wooded racquet that comes by once in a while and I will use it just for nostalgia as it brings back memories from years ago. I should sell that thing. I was suppose to use a 2 pin adapter at the top that would fit through the center crown loops and a 1 pin adapter for the bottom to fit through the center crown loop, as you were suppose to place the frame tightly against the pins of the adapter. That worked for me for a great number of racquets and never did cause an issue. Not like in video you posted, as that video he has racquet not centered and that cannot be good. 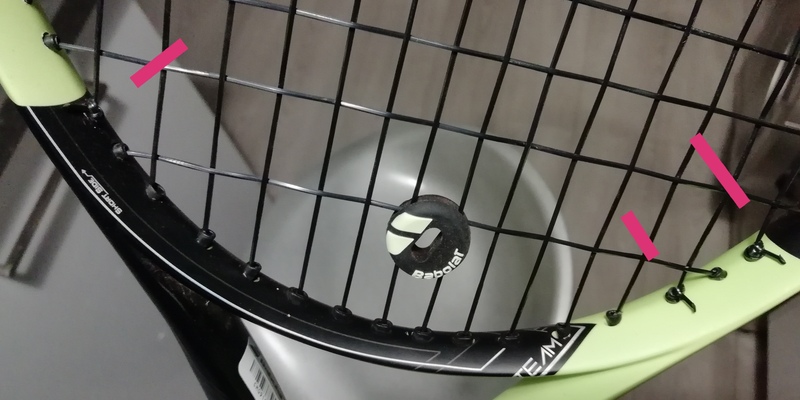 You are correct that racquet in video is not centered, and it should be when stringing. Also on left side when you go down through the loop for the 6th main string you are suppose to go then up through the loop for the 5th main, then go back up through the loop for the 7th main string, this way the string goes in the proper position on the loops and keeps string spaced properly. Many stringers missed this and was common error, as I have seen numerous racquets with that missed. Be sure to mount with 5 large crown loops on the left side as well. If you string one of these and have questions, just start a new thread and I will try and answer for you. It's not a bad racquet to string, but has been a while since I did one of them, as they are not so popular now. Try stringing the mains opposite to what is said in #43 and you'll get the crosses strung ATW down to top. My question still stands, why would you want to do that with a tennis racquet? Again, the method is called ATW, not Top Down. What are you talking about? Ok, I’ll play. “Space Shuttle.” Come at me. This is the meaning of a stringer and the starting clamp, not the purpose. My purpose as a stringer can be very different from yours. And I replied, this is not why it is called ATW. More reading comprehension, please. Don't waste my time. Your answer explains how to do it, not why. Who’s wasting whose time? I played today in tournament (I won) and it was really stiffer than usual, with different (bad) sound... My usual tension is 22 with 2 knots... So I would ask you to tell me if the job of my stringer could be bad...? Here is two pics of the knots. 3 knots downside and 1 knot upside... Is it correct? ?